The US Food & Drug Administration defines extractables as ‘compounds that can be extracted from a container closure system when in the presence of a solvent’ and leachables as ‘compounds that leach into the drug product formulation from the container closure as a result of direct contact with the formulation’. The reason for monitoring and analysing these substances is that they may pose a safety risk to the patient directly, or indirectly, by altering the product’s physico-chemical properties through interactions with the active pharmaceutical ingredient or excipients, thereby adversely affecting product quality. The safety assessment/qualification of E&L is an important component of the qualification of container closure systems (container selection) and, by correlating extractables to leachables, it is possible to determine extractable limits that can provide safety guidelines on leachables. To comply with safety requirements, it may be necessary to change the nature, composition or manufacturing process of the packaging material or a component of the package or change the formulation of the drug product. Before starting a risk assessment, it is essential to demonstrate that all these factors are under control. Project preparation – preliminary work and risk assessment: A typical E&L assessment is comprised of a number of milestones, from project preparation, through risk assessment, experimental procedures and product development. The materials chosen to make a container closure system typically undergo a series of selection filters. Thus, the first requirement in any E&L study is to collect information from container and packaging suppliers on: the system’s functionality, the protection properties regarding the drug product, the materials’ chemical compatibility/resistance, and on compendium or food compliance of the packaging components. These materials then need to be ranked, prioritised and bracketed according to the results. Once the needs list is completed, the packaging selection process can begin. The selection of a supplier is as important as the selection of a good material because if extractables data suitable for toxicological evaluation are not available by the end of the E&L study, data generation falls to the drug product manufacturer. A QbD approach, which is based on the principles of the International Conference on Harmonization (ICH) Q8, embraces the complementary concepts of quality risk management and pharmaceutical quality system management as detailed in ICH Q9 and Q10, process validation and verification, and stakeholder management. 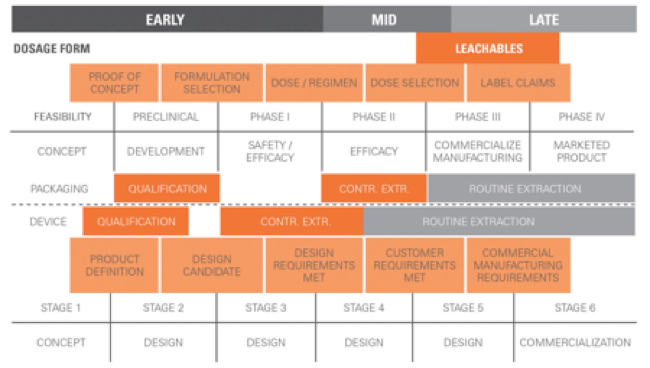 These approaches have become an integral part of drug product manufacturing, laying the foundation for quality-driven processes. Therefore, QbD principles imply that all the product packaging components must be selected and risk-assessed to consistently meet critical quality attributes of components. The experimental phase milestones include: the performance of the extractable study, initially through specifying and executing a number of protocols for extractables testing; the identification of the extractable components of the container/packaging; the evaluation of results; the generation of a report; and the definition of specification limits for a leachables study, in effect a toxicological assessment. Full method validation must be carried out for the leachables study, including method development; product-specific validation; the leachable study procedure; and definition of measurements for E&L. 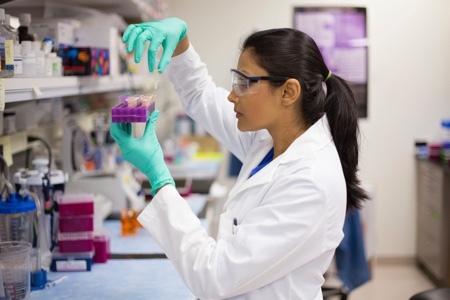 For extractables, the procedure includes the qualitative and quantitative analysis of the analyte above an analytical evaluation threshold (AET). Controlled extraction studies are performed using different solvents, and ‘worst-case conditions’ are determined. 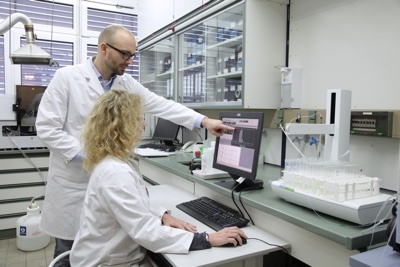 Extractables profiling is performed by applying multiple analytical methods that are demonstrated as being fit for the purpose, with a focus on the identification and calculation of the extracted amount of extractable/component from the closure device. The report should include a list of all extractables, including the quantities of each, as well as assessment of the sensitivity of the methods used, and detailed study results. Extractables of toxicological concern are then selected to develop and validate analytical methods for leachables profiling. For leachables, a qualitative analysis procedure should identify unexpected leachables and quantify how much may be present in freshly-prepared product taken from a real-time or accelerated storage procedure. This is followed by quantitative assessment of any expected leachables present above a given safety threshold. The report should include tabulation of the methods used, the limits of quantification and specification of expected and unexpected leachables, and a series of typical chromatograms demonstrating the validity of the methods. The results should include the identification of any unforeseen leached substances that are above their safety limits, as well as the cause of the leaching. The report should also include the tabulation of levels of leachables from several (at least three) batches of product/device. Figure 1 shows the typical progression of product development. In performing E&L studies for packaging it is essential to compare and prioritise risks. This requires the evaluation of multiple diverse quantitative and qualitative factors for each risk and involves breaking down a basic risk question into as many components as are needed to identify the factors contributing to the risk. 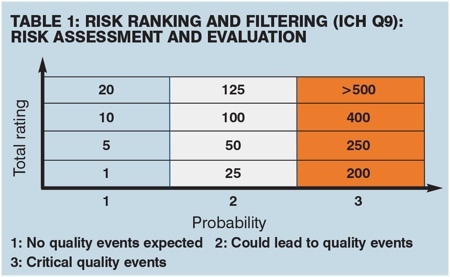 These factors are then combined into a single relative risk score that can then be compared, prioritised and ranked against those of other risks. Risk assessments – eliminating potential quality problems: It is vitally important to evaluate products and processes that demonstrate recurring quality-relevant problems. Risk assessments are based on risk identification and the rationale behind that identification. Product contact must also be assessed: for operations that involve a change in product quality (microbiology, filtration, virus removal, etc. ), huge surfaces in contact with the product could have more impact on drug product quality than components having a small surface contact with the drug. During intermediate storage, any interaction between the product and consumables can have a significant effect due to the longer contact time and, during the manufacturing process itself, process impact or conditions of use can have significant effects. For example, sanitation procedures when using ozone, ethylene oxide, irradiation or sodium hydroxide solution employing steam or harsh solvents may be aggressive towards the consumable and may increase risk of the release of extractables or particles. 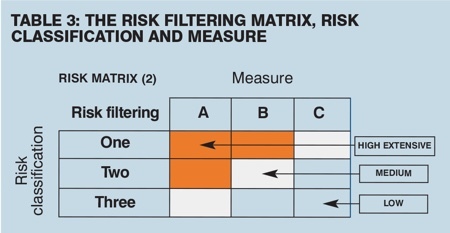 Table 3 shows an example of the use of a weighting grid for ‘other plastic consumables’ risk analysis. Sources of extractables – polymer chemistry: Figure 2 shows the potential for E&L to become problematic. The problem is essentially how to keep the supply chain under control. This poses a number of challenges, as there are often modifications made to polymers by vendors, and there is a constantly changing polymer market. It is essential to ensure that the supplier maintains the quality of its product, and this can be achieved by stipulating within a quality agreement that the supplier is obligated to inform the user of any polymer specification changes. It is good practice to qualify alternative vendors, thus securing the required delivery of consumable, to routinely undertake chemical profiling of incoming critical polymeric components and frequently perform quality audits. 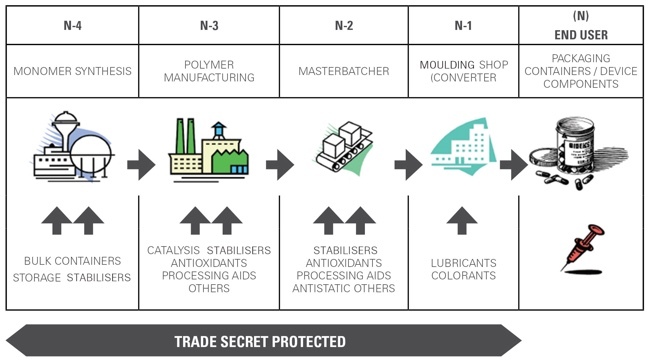 Figure 2: Source of contamination: Polymer chemistry – is the supply chain under control? Establishing test conditions: When performing E&L testing, it is important to choose realistic extraction conditions. For example, solvents may be classified as soft or harsh. Soft solvents include: water at neutral pH with extraction at its boiling point (refluxing); water at high pH (9.5) and low pH (2.5) with extraction below the boiling point; drug vehicle if feasible with extraction below the boiling point; mixtures composed of aqueous (buffer) and organic modifier, e.g. isopropyl alcohol/water (1/4:3/4; 1:1 mixtures), with extraction below the boiling point. Harsh solvents include extraction at their boiling points using: dichloromethane, n-hexane or isopropyl alcohol. A complete extractables assessment will include the use of multiple conditions (Soxhlet, reflux), varying the duration and temperature of extraction, the material weight-to-extraction matrix volume, and the extraction process itself. A useful approach is to employ more aggressive conditions than normal for a given system; however, it is important to avoid decomposition of the polymer. 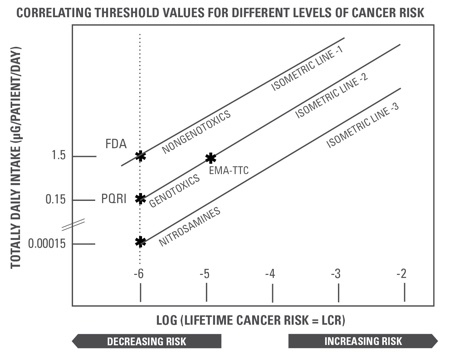 Figure 3 illustrates the toxicological risk associated with safety thresholds in quantitative evaluation of extractables. Equally important is the choice of the appropriate tools for separation and detection. For example, volatile organics are determined by gas chromatography (GC) (head-space technique, TDMS, FID and MS detector); semi-volatile organics are determined by liquid injection gas chromatography (FID and MS detector); non-volatile organics by high-performance liquid chromatography (HPLC) (DAD, LC-MS/(MS) with accurate mass assignments; metals and/or elements by ICP-MS, ICP-OES; and cations and anions by ion chromatography. Special techniques are employed for critical compounds – e.g. GC-TEA for nitrosamines; and perfluorinated carboxylic acids, amides and sulfonamides are determined by LC-MS/MS, NMR technology and other specialist methods. What is a trustable identification? The aim is to establish a classification scheme that characterises the significance of peak identification data (tentative, confident, confirmed and unknown). ‘Best identification’ means the comparison of both the retention index and the mass spectrum of an extracted component with its authentic reference standard. For leachables, the strategy is to perform a toxicological assessment and select substances of concern. It is essential to validate the analytical methods, as these should have the capability to discover unexpected leachables. The methods developed for leachables studies will be specific to the finished product and will assist in determining shelf-life acceptance criteria for leachables based on the toxicological risk assessment. 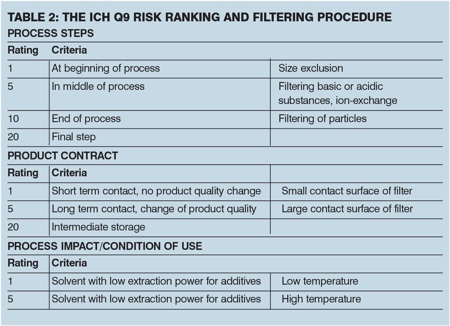 It is normal to use three different production batches for long-term, intermediate, and accelerated assessment, and storage has to be in accordance with ICH Q1A guidelines. It is important to demonstrate a complete profile, an endpoint analysis is not adequate. 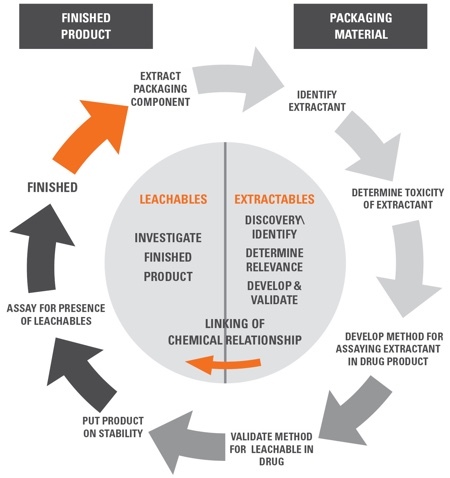 Figure 4 provides a summary of E&L testing for containers, closures and packaging, illustrating the chemical link between finished product and packaging material, and demonstrating how such studies should be performed.